Today I got to be the Lord's messenger of the great message of hope He sent to my grandson, Lincoln George. 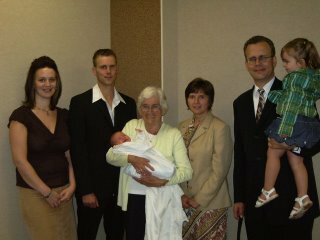 On this picture you can see Sharon, Matthew, Great-Oma holding Lincoln, Dora, and me holding Ava. It was a great Sunday. God is so good!